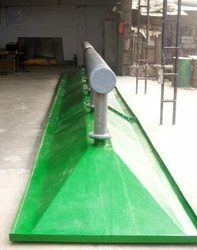 We are a leading manufacturer in FRP Suction hood. This hood is specially made for the fume control process while refining of gold, silver or any of the metal. This is very successful product for the refining process. We bring forth an exclusive array of FRP Fume Hoods to our customers. These products are highly acknowledged in the market owing to their excellent performance and low maintenance. Our products are articulately designed by our team of experts and professionals and have been acknowledged in domestic markets. FRP Fume Hoods are used in chemical industries.